Steph over at Steph’s Bite by Bite is holding an online bake sale to benefit the Leukemia and Lymphoma Society. I am donating 2 dozen sugar cookies for her auction. The bake sale starts this coming Friday, March 2 and will be on Steph’s blog. Be sure to check it out! I have the worst sweet tooth. Seriously--I could eat dessert after every meal and be the happiest girl ever. I know this is not healthy and have been attempting to curb my habits. I have been doing so well the past few weeks and decided to reward myself with a batch of yummy sugar cookies (makes sense, right?). 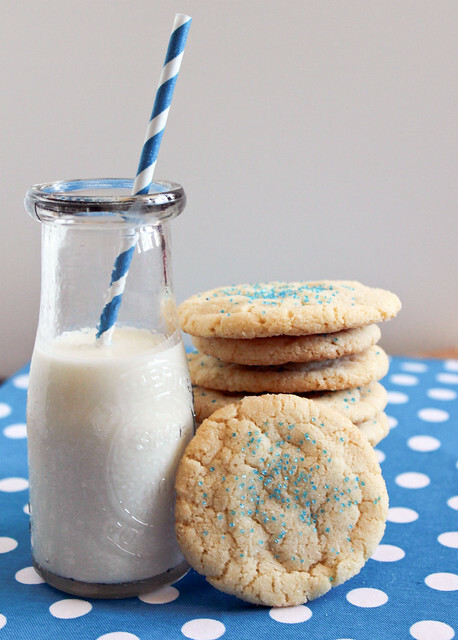 Sugar cookies are my absolute favorite cookie and I truly have a weakness for them. While I have my go-to cut-out sugar cookie recipe, I have been on the search for a great soft & chewy sugar cookie. As soon as I saw the recipe for these, I knew I had to make them! 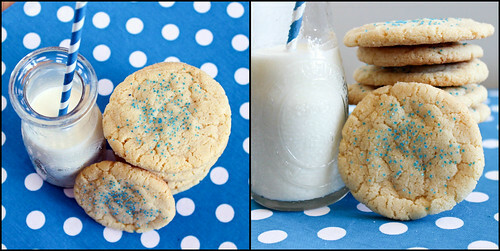 They are everything I love about a sugar cookie--soft, chewy, wonderful exterior--perfection. These cookies also come together quickly and do not require a mixer of any sort. I made these cookies as the directions stated, rolling 2 tablespoons of dough into a ball and then rolling it into sugar (which is how the directions read below). The next time I make these I will make them a little smaller but that is just my personal preference. I will also refrigerate the dough some before I bake it. I think my dough was a little too warm which made my cookies spread a bit too much. No worries though, these cookies were still perfect--soft and chewy on the inside! I made a batch of 9 and froze the rest. This way whenever I want a fresh baked cookie, I can make one or two and not have to make a full batch.